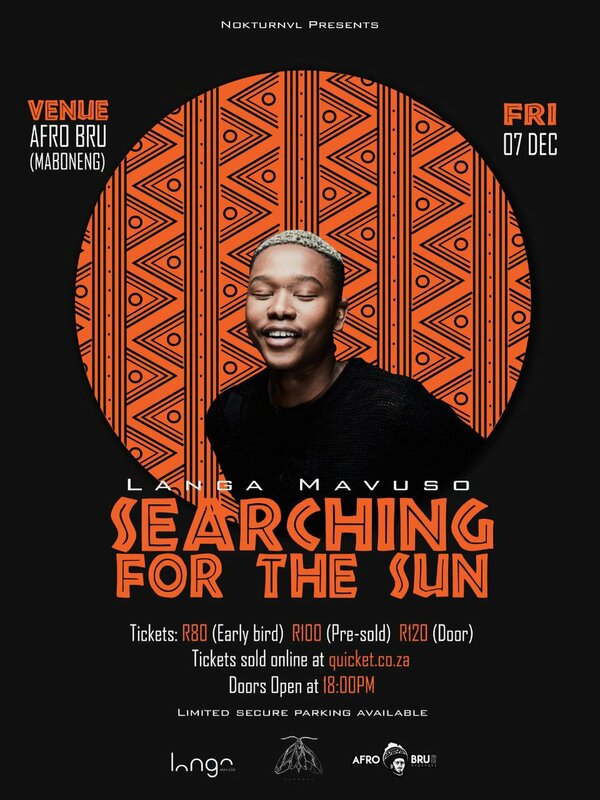 The popular vocalist will be bringing his Searching For The Sun show to Afro Bru in Maboneng this coming Friday, 7 December 2018. ‘Sunday Blues’ hit-maker, Langa Mavuso, is gearing up to host his Searching For The Sun show this coming Friday, 7 December 2018 at Afro Bru in Maboneng, Johannesburg. The singer and songwriter released his debut EP, ‘Liminal Sketches,’ in 2016, but it was the release of ‘Sunday Blues’ that gained him much traction. “Business-wise, music is my bread and butter and I treat it as such. I believe that music is both a product and service that is offered at a specific value point. At this stage and time in music, I believe that recorded music should be free, almost an invitation or enticement into the high-quality service of live performance and visual artistry,” he added. Tickets for the event are available for purchase online from Quicket, with early-bird tickets retailing at R80, pre-sold at R100, and R120 at the door. The show is scheduled to start at 18:00.